Lotta is five years old, and she lives on Troublemaker Street with her parents, older siblings, Maria and Jonas, and her stuffed pig, Bamsie. One morning, after dreaming that her siblings hit Bamsie, she wakes up in a terrible mood, believing that the events in her dream actually happened. After that, though she would rather go naked than wear it, her mother tries to dress her in an itchy sweater. Fed up, she destroys the sweater then runs away to Mrs. Berg's house next door. Mrs. Berg helps her set up shop in the attic, and Lotta plans to stay forever... until she realizes how dark it gets at night. I never cared for Pippi Longstocking as a kid, but I do wish I had known about Lotta! Like Ramona, Clementine, and Junie B., Lotta is a spirited little girl with a lot of personality, just trying to make sense of growing up. Like Alexander in Judith Viorst's famed picture book, Lotta is having a bad day, and all she wants to do is escape. Kids and adults of all ages can relate to this universal experience, and kids, especially, will be thrilled to live vicariously through Lotta's new life in the attic next door. I think they will also love Mrs. Berg, who acts as a grandmotherly figure in Lotta's life, and whose approach to Lotta's anger at her parents is reminiscent of Mrs. Piggle Wiggle. This is a chapter book, but a very short one, and many of Lotta's other stories - at least the ones at my library - are longer picture books instead. The edition I read for this review actually came out in 2001, with illustrations by Robin Preiss Glasser, who draws Fancy Nancy. Any Fancy Nancy fan who sees the cover of this book will be instantly drawn to it, if only to make sure it isn't about Fancy Nancy! 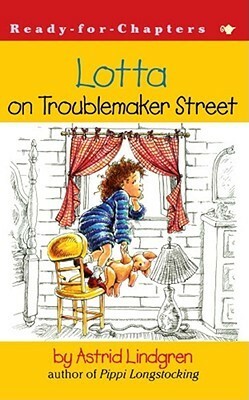 Lotta on Troublemaker Street is also a great choice for preschoolers whose parents read them chapter books at bedtime. The story perfectly embodies the mind of a real five-year-old, and kids will enjoy the comfort that comes from seeing an end to Lotta's terrible day. This book is charming and funny, and thankfully, still in print! Try it out with a parent/child book club for kindergarten or first graders, or as a bedtime read-aloud with your own five-year-old on his or her worst day. For other old school read-alikes, try Two of a Kind by Beverly Cleary, Nora and Mrs. Mind-Your Own-Business by Johanna Hurwitz, or Betsy's Little Star by Carolyn Haywood.